BELLFLOWER – Mayfair High School salutatorian Tiffany Nguyen compared high school to a firework during her school’s June 15 graduation ceremony – lively, memorable, yet ultimately somber since it was too brief – and encouraged her classmates to take advantage of life’s new experiences. 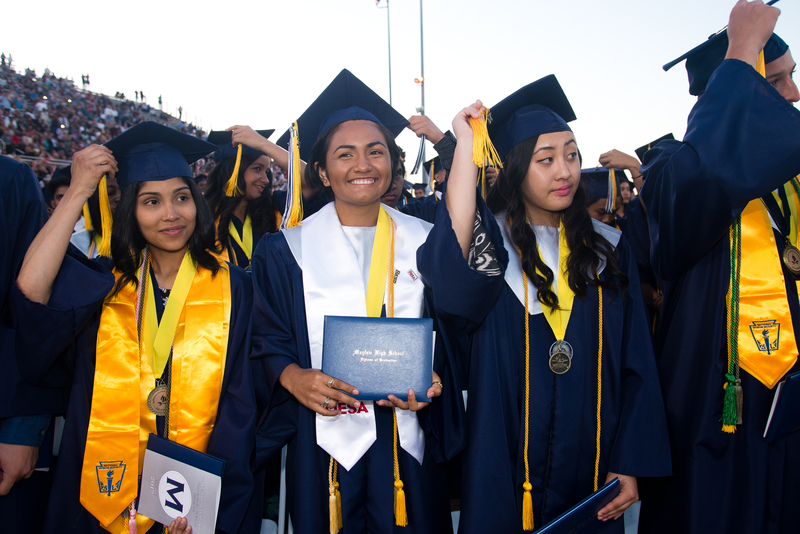 More than 7,000 friends and family members filled the seats and walkways of Bellflower High’s Ron Yary Stadium to celebrate the academic achievements of Mayfair High’s 486 graduating seniors. Nguyen will attend UC San Diego, with the help of the Dr. Linda Evans Memorial and Intensive Learning Center Parent Teacher Student Association (ILC PTSA) scholarships, to major in biochemistry in the fall. She earned a 4.64 GPA while at Mayfair High, taking nine Advanced Placement (AP) classes and several honors courses while being active in history club, California Scholarship Federation and the Mayfair Reads Committee, and the Link Crew – which mentors freshmen. She plans to pursue a career in the medical field. Rodriguez, who graduated with a 4.7 GPA, emigrated from the Philippines in 2010 and pursued academic excellence as she assimilated to the U.S. She took 11 AP classes, scored straight A’s and has taken part in a variety of sports including badminton, golf, track, karate and figure skating. She plans to become a neuroscientist, researcher or doctor. 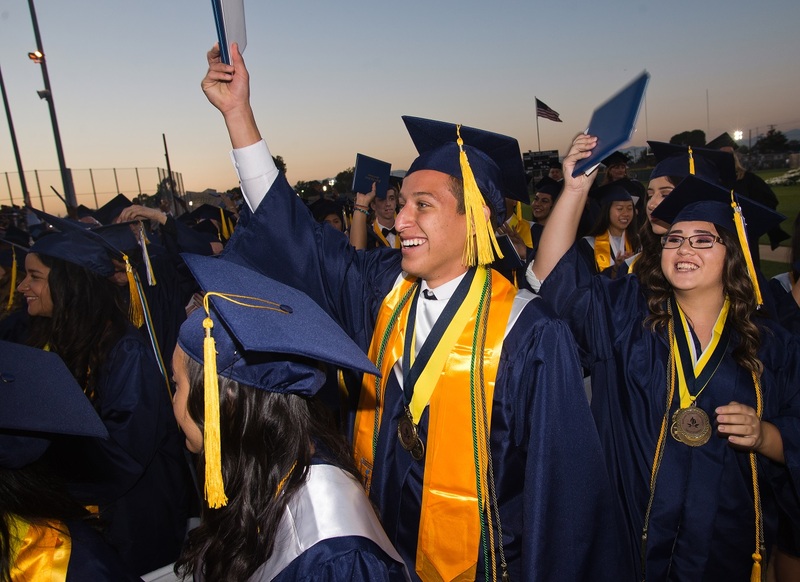 Mayfair High’s seniors will attend prestigious colleges across the U.S., and some 47 students received 26 scholarships from school and community groups totaling more than $46,000. The ceremony also recognized 20 students honored with department and Mayfair Distinguished Awards; 24 Mayfair Academic Program graduates; 206 students who achieved honors, high honors and highest honors; 123 Golden State Seal Merit Diplomas, and 62 students who received the Seal of Biliteracy for fluency in more than two languages. Following the awarding of diplomas, members of the graduating Class of 2017 gathered arm in arm to sing Mayfair High’s alma mater before being mobbed by the embraces of friends and family members. BUSD_MayfairGrad_1: Mayfair High School graduates smile and cheer at the conclusion of their school’s June 15 graduation ceremony, hosted at Bellflower High School’s Ron Yary Stadium. 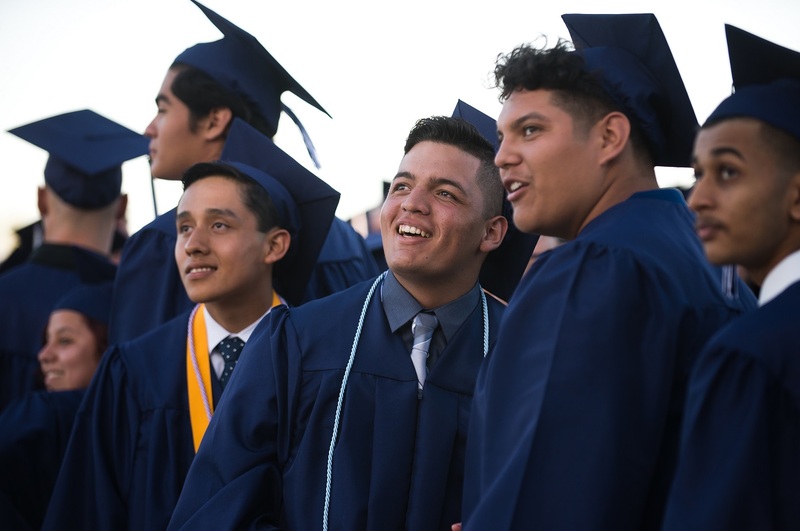 BUSD_MayfairGrad_2: A group of Mayfair High School graduates pause as they watch the fireworks display at the conclusion of their school’s June 15 graduation ceremony, held at Bellflower High School’s Ron Yary Stadium. BUSD_MayfairGrad_3: Mayfair High School graduates cheer their fellow classmates during the school’s June 15 graduation ceremony, hosted at Bellflower High School’s Ron Yary Stadium. BUSD_MayfairGrad_4: Mayfair High School grads hold up their diplomas at the end of their school’s June 15 graduation ceremony. More than 7,000 attendees crowded into Bellflower High School’s Ron Yary Stadium to witness the achievements of the class of 2017. BUSD_MayfairGrad_5: Mayfair High School graduates smile and cheer at the conclusion of their school’s June 15 graduation ceremony, hosted at Bellflower High School’s Ron Yary Stadium. 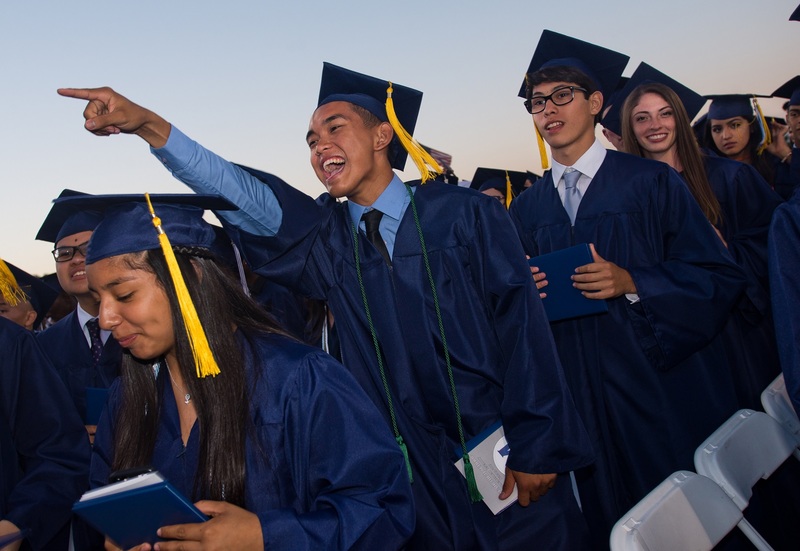 BUSD_MayfairGrad_6: Mayfair High School’s 486 graduating seniors ceremoniously turn their tassels, signaling their final acts as high school students, during their school’s June 15 graduation ceremony, hosted at Bellflower High School’s Ron Yary Stadium. BUSD_MayfairGrad_7: A group of Mayfair High School graduates pause as they watch the fireworks display at the conclusion of their school’s June 15 graduation ceremony, held at Bellflower High School’s Ron Yary Stadium. BUSD_MayfairGrad_8: Mayfair High School’s class of 2017 meet in their school’s gymnasium before the school’s June 15 graduation ceremony, held at Bellflower High’s Ron Yary Stadium. A group of Mayfair High School graduates pause as they watch the fireworks display at the conclusion of their school’s June 15 graduation ceremony, held at Bellflower High School’s Ron Yary Stadium. 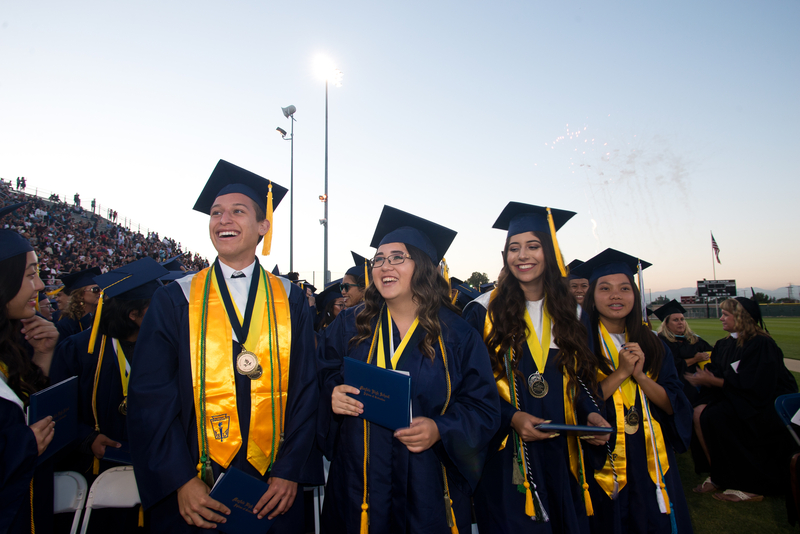 Mayfair High School graduates smile and cheer at the conclusion of their school’s June 15 graduation ceremony, hosted at Bellflower High School’s Ron Yary Stadium. 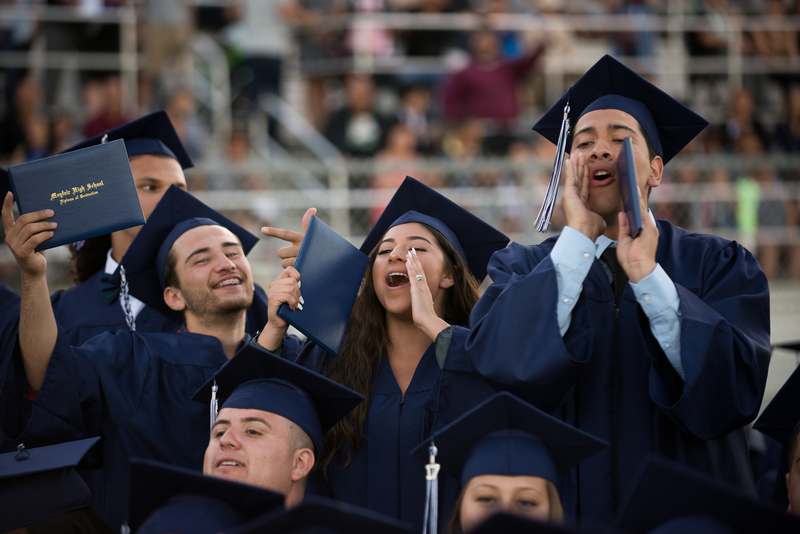 Mayfair High School graduates cheer their fellow classmates during the school’s June 15 graduation ceremony, hosted at Bellflower High School’s Ron Yary Stadium. Mayfair High School grads hold up their diplomas at the end of their school’s June 15 graduation ceremony. More than 7,000 attendees crowded into Bellflower High School’s Ron Yary Stadium to witness the achievements of the class of 2017. 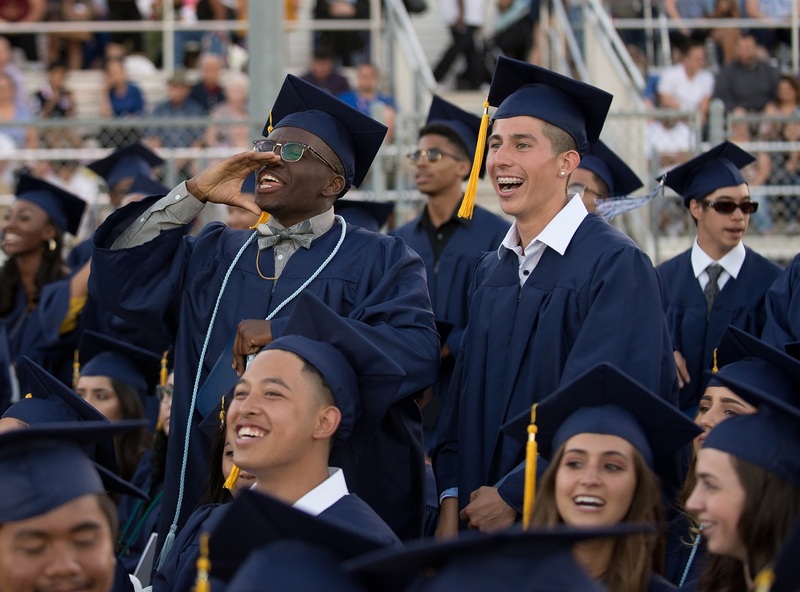 Mayfair High School’s 486 graduating seniors ceremoniously turn their tassels, signaling their final acts as high school students, during their school’s June 15 graduation ceremony, hosted at Bellflower High School’s Ron Yary Stadium. 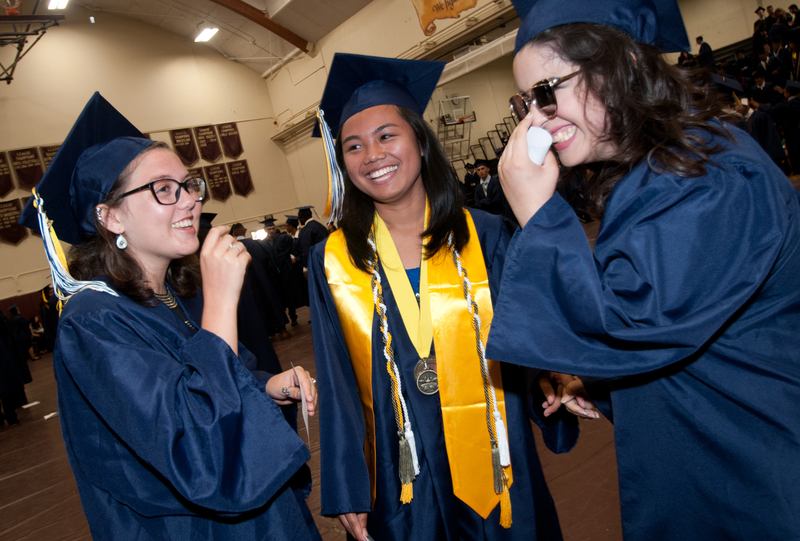 Mayfair High School’s class of 2017 meet in their school’s gymnasium before the school’s June 15 graduation ceremony, held at Bellflower High’s Ron Yary Stadium.